for the love of ramen. the other night, my friend amy mentioned that she had been watching the mind of a chef on netflix, and that i might like it too. the series follows david chang (of the momofuku restaurants) as he travels, eats, cooks, and shares his process. he even takes other cuisines and adapts it into his own style - i.e. making gnocchi out of instant ramen (true story), or making microwavable strawberry shortcake. it is awesomeness. and involves a lot of ramen (one of his most popular restaurants is the momofuku noodle bar, known for amazing ramen). 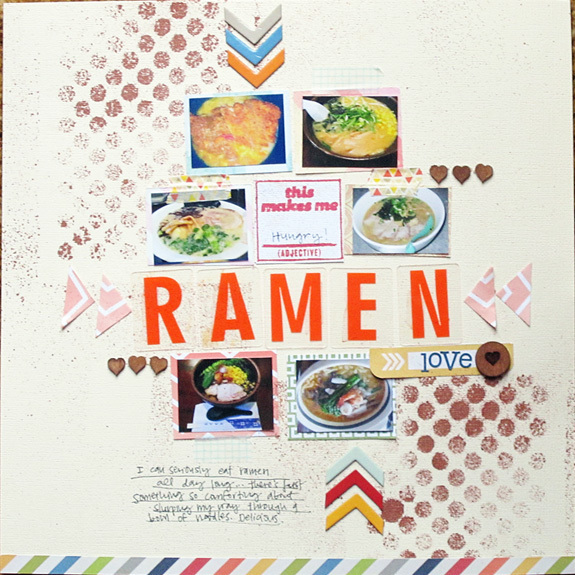 which made me pull out all my pictures of the bowls of ramen i've consumed over the last year or so, and throw this page together. yep. i totally scrapped about ramen. don't judge. amy and i are totally high-fiving ourselves for discovering this little gem of a show. and i'm craving a bowl of ramen so bad. and i want to go back to japan to eat my way through the country again. and i want to go back to NYC to eat at momofuku. OMg! I love love love ramen too! I see you live in SF... Have you been to the ramen spots in the SF Bay area? My fave is Ramen Halu in San Jose. thanks for google who send me to your site and your great post. This is a nice blog.